Despite constant assertions to the contrary, it would seem the good folks at Harley-Davidson have a rather poor sense of their own history. Case in point: a recent Harley-Davidson insert in Dealernews, a magazine that bills itself as the voice of powersports retailers. The insert, which was also sent to the Harley-Davidson dealer chain, is a glossy, 14 X 20 fold out poster that lists the 2013 recipients of the Motor Company's Bar & Shield award, which, according to the blurb -- and pardon my paraphrasing here -- is based on sales, customer satisfaction, and “various operational measures.” Also listed are the names of long-term dealers, notably that of Dud Perkins, the San Francisco dealer that’s been selling the brand continuously since April 1st, 1914. Now, you’d think that a company so steeped in tradition and so aware of its own history would choose a cover portrait worthy of its legacy. Something that represented one of their many race victories perhaps, or, I dunno, maybe a portrait of someone that helped steer the company through its many years of success. You have to figure that a company that’s been around since the inception of motorcycling would have literally tens of thousands of images to choose from, one that would sum all that’s good and true about them. After all, a picture is worth a thousand words, so this particular one, which was intended to honor the dealers that made them the company they are today, should be a doozy right? Well it is. The photo that Harley chose, is one of an archetypical American dirt tracker, backing his archetypical American dirt track motorcycle into turn. Presumably H-D picked the shot because nothing says American motorcycle like an old dirt tracker and no riders better exemplify what the typical H-D rider is all about than guys that raced them, guys that were tough as leather with reflexes of a gunfighter. There’s only one slight problem. 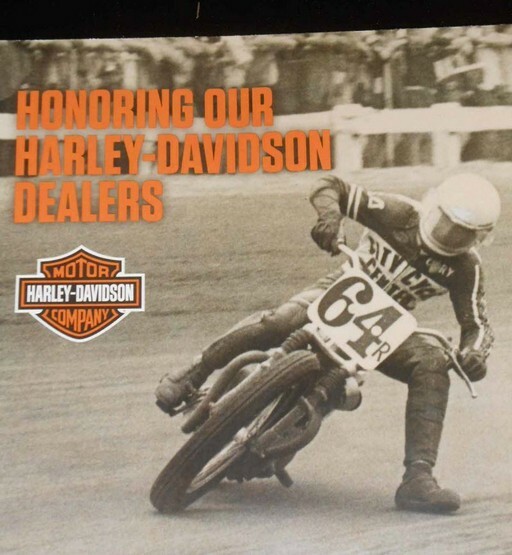 The photo that Harley-Davidson used to celebrate their dealers is of a guy named Gary Scott, and what he’s riding is a Triumph. That the photo is of someone riding a Triumph is bad enough. It speaks poorly of whoever picked it, and of the H-D executives that approved it. But it gets worse. For those of you that aren’t students of dirt track history, the name Gary Scott probably doesn’t mean much. According to the record books he was a hard-charging rider and member of the 1974/1975 Harley-Davidson race team who won the 1975 AMA Grand National Championship, and accompanying number one plate. What the record books don’t tell you is that he hated riding for Harley, didn’t get along with the other members of the team, and quit the team shortly after winning the title. He then forbid them to use his name or photo in any of their advertising. To say that the relationship between Gary and H-D was adversarial would be a gross understatement, one he’d later underscore by engaging in physical altercation with his former tuner, and all around Harley good guy, Bill Werner. In short, the image is something of a slap in the face to the Harley faithful, and their dealers. It also displays a lack of knowledge about the factory’s history, history which is well documented. Of course Harley has always had a little trouble separating myth from their reality, so perhaps this isn’t such an unusual thing after all.